There’s a new mental health resource in the county. On Wednesday afternoon the new Summit Safe Haven Walk-in Crisis Center opened its doors for the first time to provide community members with a preview of the facility. The center, located in the Frisco medical office building next to St. Anthony Summit Medical Center, will provide the area with a facility for individuals suffering from a mental health or addiction crisis to receive evaluation and treatment. The crisis center will also serve as a mental health acute treatment unit, along with a withdrawal management unit, for individuals necessitating additional care. The unit has been in the works for about two years following the passage of Senate Bill 17-207, meant to expand and strengthen the state’s behavioral health crisis system in part by providing millions in enhancements. In addition to the $7.1 million provided to the Office of Behavioral Health to expand the crisis system around the state, the Western Slope was provided another $976,255, largely split to help fund (along with numerous partners) new crisis stabilization units in Summit and Montrose counties. The extra money was well appreciated, and necessary for those in the field. Hoy said that the crisis system was particularly weak on the Western Slope. She said there are about 12 psychiatric beds per 100,000 people in the state, but currently just six per 100,000 out west. Once it opens, the facility will remain available 24/7 year-round, allowing anybody to walk in to receive an evaluation from the crisis management team with no charge to patients. From there, the team will decide on the best treatment path for each individual depending on factors such as risk and the patient’s history. Following evaluation some may be admitted to the acute treatment unit, where adults ages 18 and up can stay for up to five days. The ATU consists of six beds in three rooms, along with a day room, kitchenette, nursing station, a small outdoor area and a “seclusion room” where guests can take some time to be alone. 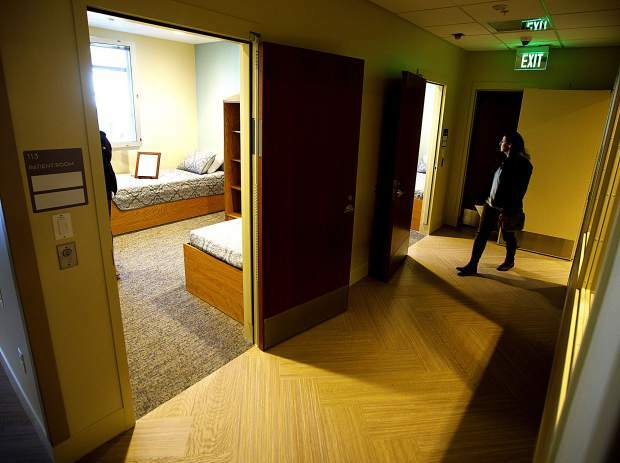 There is also a secured entrance in the back where law enforcement can drop off individuals in crisis, and all of the rooms are outfitted with anti-ligature fixtures to prevent patients from harming themselves. The facility is staffed full-time by registered nurses, clinicians and nurse practitioners. Additionally, the program has partnered with West Springs Hospital in Grand Junction to providing telepsychiatry services. There is no cost to patients at the ATU who are either uninsured or on Medicaid. Hoy said Mind Springs is currently working on contracting with private and commercial insurance companies to support the service. In addition to the ATU, Mind Springs is also set to reopen its withdrawal management unit, a facility attached to the ATU where individuals can detox in a safe environment and receive medical treatment if necessary. Like the ATU, the detox center is available at no cost to people who are uninsured or on Medicaid, and offers a sliding scale for insured individuals. The crisis center doesn’t have a set opening day yet, though it’s likely to open sometime in May. The detox center is scheduled to open on April 19. Along with the walk-in center in Frisco, Colorado’s larger crisis services are available 24/7 for anyone looking for help with mental health, substance abuse or emotional crisis. Individuals in need can call 1-844-493-TALK (8255), or text “TALK” to 38255 to speak confidentially with a trained professional. Visit ColoradoCrisisServices.org for more information.